Made in Cremorne, New South Wales, Australia, 1950. Plastics have been described as “materials that can be moulded or shaped into different forms under pressure or heat.” They were a cultural phenomenon in the twentieth century, when they changed the way objects were produced, designed and used. It was also in the twentieth century that most plastic products moved away from natural raw materials to synthetically produced ones. 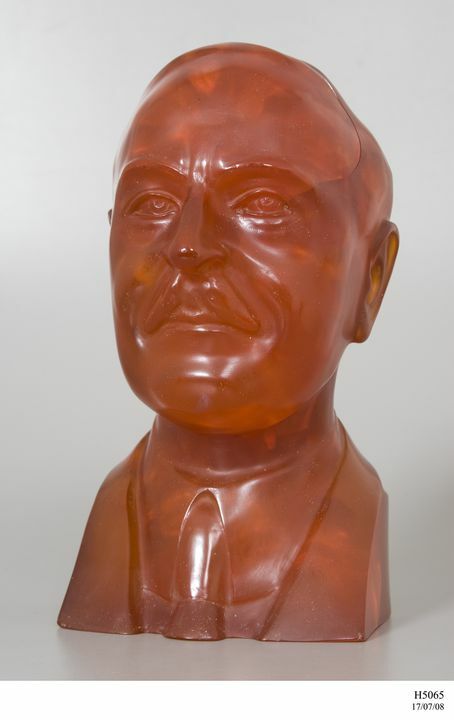 A cast synthetic resin bust in a translucent red colour depicting Dr Baekland - the inventor of Bakelite. It shows a middle aged man facing front on with a moustache and receding hairline. Slightly frowning expression. He is wearing a shirt, coat and tie and the bust is cut off at the breast and the shoulders. Basic modelling with a smooth shiny finish. This bust was made by W J Manufacturing Pty Ltd in Cremorne, New South Wales, Australia, in 1950. W J Manufacturing was taken over by Hooper Bailie Industries Ltd in 1974. The bust is made from a phenol-formaldehyde resin, commonly known as 'Bakelite'. Many raw materials can be used in the manufacture of the phenol-aldehyde resins. The phenol bodies (phenol or cresol) were generally used because of their availability. In the aldehyde series, formaldehyde was commonly used in the production of the resin. Formaldehyde (normally a gas) was preferred because it had a rapid moulding cycle. Traditionally, phenol was obtained in large quantities as a by-product of the distillation of coal. However, by the 1940s, most phenol was manufactured synthetically from benzene and air. When phenol and formaldehyde are condensed with an acid catalyst, such as hydrochloric and sulphuric acids, they form resins which are permanently soluble and fusible . In 1907-1910 Leo Hendrick Baekeland discovered methods by which the resin could be mixed with sawdust and colorants to produce a moulding powder which, when subjected in a mould to heat and pressure, would produce a solid, infusible, insoluble, moulded shape with excellent mechanical and electrical properties . Baekeland's development of phenolic plastics during the first decade of the twentieth century, which culminated in the release and marketing of 'Bakelite', was an outstanding achievement that revolutionised developments in materials science, the reactive chemistry of phenols and formaldehyde, product manufacture, and industrial design generally. The General Bakelite Company (later the Bakelite Corporation), New York, was established in 1910 specifically to manufacture and market the resin known as 'Bakelite', the first widely used synthetic plastic. Baekeland was the President of the organisation from 1910 to 1939. By the end of the first decade of the twentieth century, Baekeland had also taken out patents for 'Bakelite' in Germany and France and formed companies in those countries to exploit Bakelite and Bakelite products. When Baekeland died in 1944, his products were in use by nearly every industry and his life's work had been recognised by numerous scientific and academic bodies throughout the world. For many people, he is 'the father of the plastics industry'. Correspondence from A. R. Penfold to A. C. Breskin, Museum Archives. The Plastics Historical Society , Bakelite Information Sheet [online], Available at: http://www.plastiquarian.com/LHB.htm, accessed March 2008. The museum's plastics collection began in the 1930s with the acquisition of specimens of plastic raw materials and finished products. The collection was driven largely by Arthur de Ramon Penfold (1890-1980), a former industrial chemist, who worked as curator and later director of the museum from 1927 until 1955. In 1950 Penfold requested this Bakelite bust to be made as an addition to the already growing plastics collection. Penfold wrote to plastics expert A. C. Breskin in America for quality drawings of Dr Baekeland, the inventor of Bakelite plastic, to be dispatched by airmail immediately. The bust was commissioned to be made by the W J Manufacturing Company, then acquired into the Museum's collection.